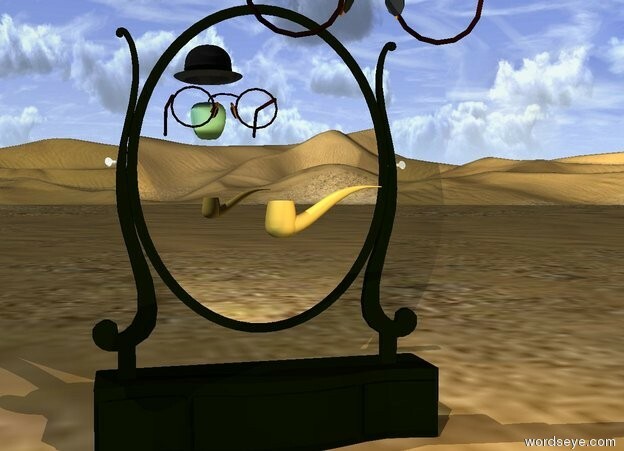 Input text: a pipe is a foot in front of the mirror. it is 1.5 feet above the ground. the hat is 1.5 feet in front of the pipe. it is 3 feet above the ground. the celadon green apple is 2 inches below the hat. the big pair of eyeglasses are behind the apple. they are facing back. the gold light is behind the glasses. the sun is summer rain blue. the baby pink light is in front of the pipe. the camera light is sea mist blue. H. G. Wells' Invisible Man?